Loaris Trojan Remover aids in the removal of Malware – Trojan Horses, Worms, Adware, Spyware – when standard anti-virus software either fails to detect them or fails to effectively eliminate them. Standard antivirus programs are good at detecting this Malware, but not always good at effectively removing it. The majority of Anti-Malware Scanners well detects malicious software – Trojan Horses, Internet Worms, Adware and Spyware. But they are not always efficient in removing them once they have been triggered. Loaris Trojan Remover goal is specifically to disable or remove Malware without the user having to manually edit system files or the Registry. The program also removes the additional system modifications some Malware carries out which are ignored by some standard antivirus scanners. Loaris Trojan Remover scans ALL the files loaded at boot time for Adware, Spyware, Remote Access Trojans, Internet Worms and other malware. Two types are available. The Standard scan quickly scans the system with no need for further configuration of the scan parameters. The Custom scan allows the user to select any of the folders for scan. The malware programs have the ability to track your browsing habits and even steal personal information. Such as bank account numbers and passwords. Spyware has the power to install more parasites on your computer without your consent. Everything you do and everything you type is being recorded right now! Hackers will access your PC and do anything they wish. Also they can even steal your Identity and You would never be the wiser! Some Malware programs make changes to the Internet Explorer Home, Start and Search Page settings in order to re-direct the web browser to different websites. 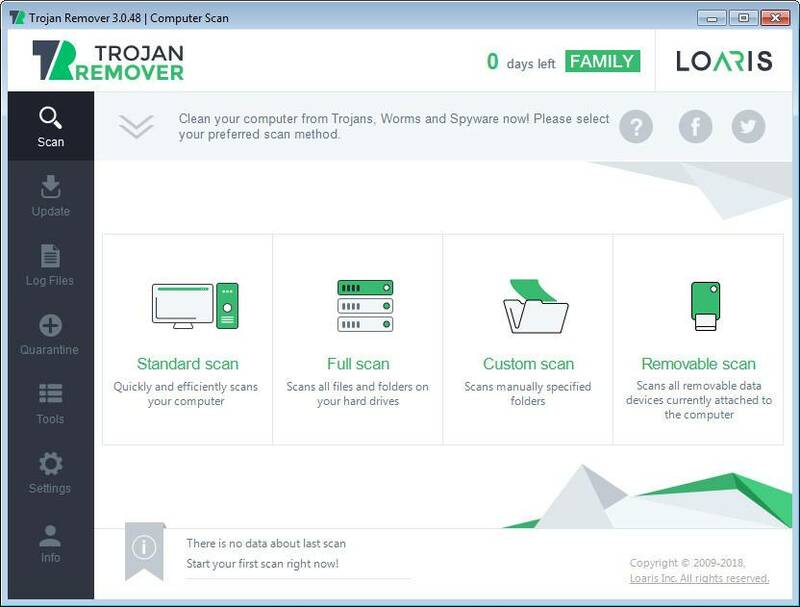 Loaris Trojan Remover will reset the Home, Start, Search pages to standard Defaults. You can then manually reset your Home Page to your website of choice. The Windows HOSTS file is a text file which stores website addresses. The file can be used to speed up access to websites you visit often. By equating the website name (e.g. microsoft.com) with its DNS address, the web browser can find the website more quickly as it does not have to query a DNS Name Server. Some Malware programs add entries to this file, to either deny access to websites. Usually, security-related or antivirus company websites. Or it re-direct access to websites of their choosing. Some Malware programs attempt to prevent Windows Update from running. And inhibit access to resetting Windows Update. Also blank out the Windows Update options on the Update configuration screen. Loaris Trojan Remover will check the current Windows Update settings and correct them where necessary.